John Fisher's Cottage was built in 1840 and is an old stone croft house. Today the cottage provides self catering accommodation in a stunning area of Ross-Shire. The holiday cottage is located within the small village of Inverinate which is on the north shore of Loch Duich in Kyle of Lochalsh. This lovely holiday cottage can accommodate 6 people in a double, twin and 2 single bedrooms. The cottage has an 'L'-shaped living room with TV, and DVD player, dining room, fully equipped kitchen (with electric cooker, fridge/freezer and microwave), washroom (washing machine & tumble drier) and bathroom (electric shower over bath). There is a large secure garden. 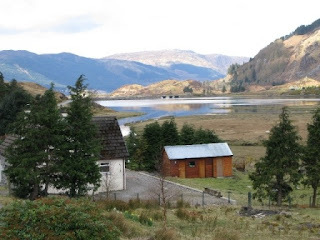 The holiday cottage is situated in the centre of Kintail, at the head of the tidal waters of Loch Duich so that the spring high tides enter the bottom of the garden. This area is ideal for a range of outdoor activities including walking, cycling, fishing, boating and golfing. There are also several interesting attractions within the county of Ross-Shire from ancient abbeys through to stately homes.